Rapid Signs has the ability to print full colour images up to 8 feet wide, by any length. From banners to vehicle wraps, your high-resolution images can become large-format promotional pieces that will attract the attention of all who see them. Solvent inks have an outdoor longevity of 3 years, and this can be enhanced with additional laminates and coatings. We can also match colours with a high degree of accuracy, if the client provides a Pantone Matching System number, or a colour chip as a reference. Full colour signs just became a lot more affordable! We have a State-of-the-Art flatbed printer, which will print a full 4’ x 8’ sheet of any rigid substrate, up to 1.5” thick! This machine uses inks which are cured with Ultra-Violet light, as the piece is being printed; when the printing is finished, so is the piece. The result is excellent colour reproduction, at good resolutions, and an outdoor life expectancy no less than 3 years. As with our solvent inkjet printing, the lifetime can be enhanced using additional laminates and coatings. Using this process eliminates the labour involved with hand lettering and lamination, and provides a cost effective solution for small-run signs that would traditionally have been screen-printed or vinyl-cut. Let’s say you just landed a contract to provide five thousand round plastic ‘sale’ tags to your client. You’ve got all the printing covered, but how are you going to cut all the tags up, without spending the rest of the month doing it? The answer is simple; Digital Die-Cutting. Rapid Signs was the first company in Canada to get the new Kongsberg table from Germany, which can die-cut, kiss-cut, router-cut, crease and engrave just about anything up to 4’ x 8’. 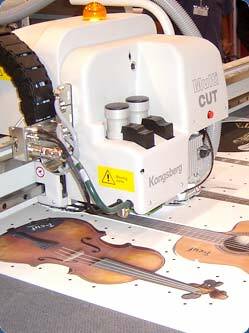 Using the I-Cut visual registration system, the Kongsberg’s camera finds dots which are placed into the artwork before it is printed, and uses these to align its blades perfectly to cut lines that are programmed into the computer. The result is perfectly cut decals, signs, or other products, in a fraction of the time it would take to hand-cut them, at a fraction of the cost of traditional die-cutting! The requisite tool for the modern sign-maker, our CNC router allows us to create beautiful architectural signage, from outdoor cut-out letters in metal, plastic or wood, to indoor directory signs and Braille signs. In combination with our other equipment, this 4’ x 8’ table allows us to do almost anything that you might see out there on the street, as well as whatever your imagination can create! A laminator is an invaluable tool for achieving high-quality results. Rather than hand-laminating prints onto substrates, we run these through our laminator to eliminate the imperfections that result from hand techniques. This gives a finish that pleases every client, every time. We can provide installation services for all the products that we sell, just ask us and we’ll get it done! A staple of the sign industry almost immediately upon its introduction two decades ago, the Gerber Edge printer produces decals that are durable, accurate and simply look great! This thermal printing device permanently fuses high-resolution images to 15" (381mm) precision punched, EDGE READY™ vinyls and films, using coloured foils that retain their good looks for up to 5 years outdoors! Besides great quality, this process also allows us to print white as a colour, making this an extremely versatile printer.